Let me make this clear, I am no Josh Brown, Jason Zweig or Morgan Housel (one day maybe…). What follows is a very humble account of why I write and how both my clients and I benefit from the process. Firstly, I love reading and I love research (it’s a by-product of my scientist days). Aside from spending time with my clients, it’s the part of my job that I love the most. The reading and the research lead to the writing. I can’t (and I am not sure anyone can) separate those processes. I have to read (or more often now, listen) to write which means that writing is an endless journey of learning and thinking. Josh Brown says that it makes him a ‘deeper and more critical thinker’ and Howard Marks recently told Barry Ritholtz in a podcast that it ‘tightens up your thinking’. When you put your words in print you expose yourself to scrutiny and, assuming you are not a charlatan, that forces you to go one-step further in your research and your thinking. By instilling the discipline of writing upon myself (I have committed to write every week), it means that I am always getting better at what I do. I have more knowledge about a wider range of topics than I did three years ago and I have learnt to articulate my ideas and thoughts more clearly. Three years ago I did not have a written investment philosophy and this was a natural progression of my writing. Constantly compounding my knowledge is a benefit to me, and I have to believe that it is of benefit to my clients. However, I want to take it one step further and say that writing doesn’t just benefit my clients, it protects them. The reason is that is forces me to behave well. As Carl Richards shows below, a good advisor stands between you and your big mistake. 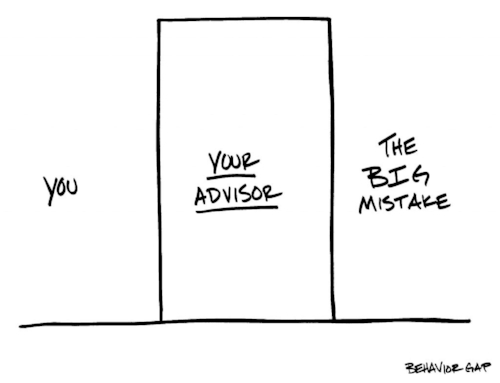 But what happens if an advisor makes a big mistake? What happens if an advisor messes up at precisely the wrong time? Perhaps they panic and press sell at the bottom or succumb to ‘career risk’ and pile into the hot thing at the top. I protect my clients by continually writing about human psychology, the biases we all fall for, the importance of focusing on the long-game, the dangers of short-term noise. How could I possibly turn around to my clients in the middle of a painful bear market and say ‘you know what, I think now is the time to get out’? I have blog post after blog post stating that this is what we must NEVER do. I think the level of accountability that advisors themselves are exposed to when they write regularly is underappreciated. Whilst I enjoy it and it helps me think, the real power of my writing is in how it protects my clients from me.